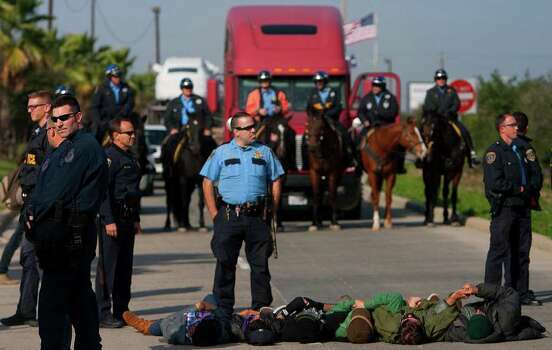 Occupy Houston protesters attempt to shut down the port of Houston back in 2011. How many had cross-hairs drawn on them by people known to the government? pic from Houston Chronicle. A federal judge has blocked an attempt by researchers to learn the name (or names) of individuals in Houston who had planned to assassinate members of Occupy Houston to prevent a shutdown of the Houston port. The lawsuit was brought by a researcher who had learned of the plot through a previous FBI FOIA release. I had reported the FBI’s release back in 2012, including the redacted page 61 with the details of the Houston assassination attempt. The FBI had defended its protection of the information. Per the article, The FBI argued information was withheld, including 12 of 17 relevant pages, to protect the identity of confidential sources who were “members of organized violent groups.” Because we all know how concerned the FBI has been about protecting the civil rights of those involved with the Occupy Movement (not). And the Judge bought the FBI’s argument. Just for a comparison of FBI reaction to ‘violent’ groups, I’d point you to some earlier posts I’d done about FBI prosecutions of other such cases. Remember that when some disaffected Occupy Cleveland refugees got together and discussed cray-cray plans about bombings, the FBI had an undercover informant keep the group together and offer to sell them a bomb in order to blow up a bridge. He even made sure that all of them found jobs so that they didn’t leave town before they could be arrested. That case, like the cases of the Newburgh 4 and the Fort Dix 5, runs perilously close to entrapment. The hapless defendants convicted in these two cases of ‘Islamic Terrorism’ had no means of getting the weaponry and explosives that were the foundation of their plans, and went forward because a government informant told them he had access to such toys. My article on the NATO 3 and the Cleveland 5 is here, and it contains links to law-school overviews of such cases that casts a jaundiced eye toward government involvement (and even possibly instigation) in such plots. There’s also this story from Radiolab, about ‘Grumpy Old Terrorists’–a group of four disgruntled seniors who were spouting rhetoric about ‘tyranny’ and ‘taking down the government’ over coffee at Shoney’s and Waffle House. They were the sort of Obama haters that the Southern Poverty Law Center has been tracking for several years, but they were just talkers. That is, they were just talkers until the FBI planted an informant with them who promised access to explosives and ricin (a deadly poison) for the right money. And suddenly, once the FBI had supplied them with a fake bomb, they became defendants in terrorism cases. The hosts of Radiolab were taken aback by the government’s involvement in helping to stir the flames with these clueless guys who probably would’ve forgotten about anti-government plots after the second cocktail at the local early bird special. What I’m trying to say here is this: In the Post-9/11 time-frame, the FBI has assiduously gone after people for ruminating about the possibility of violent action against the government and has tried to conflate the Occupy Movement with some of the violent anarchists it has tried to avoid. At the same time, The FBI (which we know now has evidence of militia people in Texas plotting to assassinate leaders of Occupy Houston) is unwilling to identify the person or persons that had both the motive and means to carry out said assassinations. IOW: the FBI infiltrated and even encouraged groups to take violent actions in order to arrest them and send them away; but faced with a real threat to people engaged in non-violent civil disobedience, refused to go after them or even identify them. People should also remember that the FBI has previously been caught in skullduggery involving protesters and activists–even predating 9/11, and even after COINTELPRO was busted back in the 1970’s. The 1990 bombing of Earth FIRST! activist Judi Bari‘s car, which nearly killed her and her companion Darryl Cherney, was clearly an assassination attempt–but the FBI and the Oakland Police Department spun it as a failed attempt by Bari to use a bomb against enemies of Earth First! and the Redwood Summer opponents in the logging industry. They even went through the motions of indicting the two. In the subsequent discovery phase of the lawsuit initiated by Bari and Cherney against the FBI, it came out that the bomb was nearly identical to the one described in detail by an FBI instructor who was lecturing OPD personnel a few weeks prior to the bombing. There has been a documentary recently released entitled Who Bombed Judi Bari? about the FBI’s complicity in the bombing. Democracy NOW did a story on the film, and the incident itself. I’m sure there’s plenty on your plate if you’ve read this far. You’re already passing petitions about the Trans Pacific Partnership, Monsanto, Black Lives Matter, and a host of other causes that are all important. But to me, this is pretty basic. The top law-enforcement agency in the US is blocking use of a Freedom of Information Act request that might shed light on right-wing plots to take down the Occupy movement and assassinate its leaders. It leads one to the question of exactly what one’s tax dollars are being spent on. One more thing–the government has gone crazy cracking down on whistle-blowers like Chelsea Manning and Jeremy Hammond (for the record, Hammond didn’t start out as a whistleblower, but his revelations about the hacking he did and how it was turned over to the FBI and CIA to be exploited surely is worth a read). Just a few weeks ago, journalist Barrett Brown was given a 63 month prison sentence for sharing a link for a website (he also faces millions in fines). The only person who’s gone to prison over the CIA’s torture program is John Kiriakou, the man who blew the whistle on it. And don’t forget that Edward Snowden and Julian Assange are still fugitives for revealing things the US government didn’t want taxpayers (i.e., the people who paid for it all) to know. The people in charge are certainly not going to tell us what’s happening and don’t want us to know. We’ll find out when the whole thing falls apart a la East Germany. Someone in the government will be too preoccupied to destroy all the files and we’ll find them and we’ll confirm (at least I will confirm) that I am not a ‘conspiracy theorist‘ but a historian.